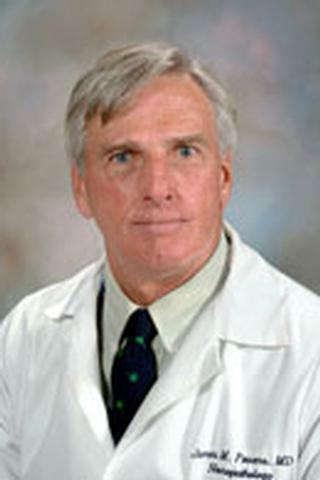 Former Director of the Neuropathology service, Dr. Powers received the Lifetime Achievement Award for Meritorious Contributions to Neuropathology from the American Association of Neuropathologists. This is in recognition of a stellar record of academic accomplishment and service to the community of families of patients with leukodystrophy. Dr. Powers' research interests include adreno-leukodystrophy, diseases of myelin, dementia (especially Alzheimer's senile and pre-senile), and neuronal migration defects and peroxisomal diseases. Hu Y, Mahar TJ, Hicks DG, Raymond D, Jones C, Wandtke JC, Powers JM, Xu H. "Malignant solitary fibrous tumor: report of 3 cases with unusual features." Applied immunohistochemistry & molecular morphology : AIMM. 2009 Oct 0; 17(5):451-7. Ali ZS, Van Der Voorn JP, Powers JM. "A comparative morphologic analysis of adult onset leukodystrophy with neuroaxonal spheroids and pigmented glia--a role for oxidative damage." Journal of neuropathology and experimental neurology.. 2007 Jul 0; 66(7):660-72. Bagaeva LV, Rao P, Powers JM, Segal BM. "CXC chemokine ligand 13 plays a role in experimental autoimmune encephalomyelitis." The Journal of immunology : official journal of the American Association of Immunologists.. 2006 Jun 15; 176(12):7676-85.